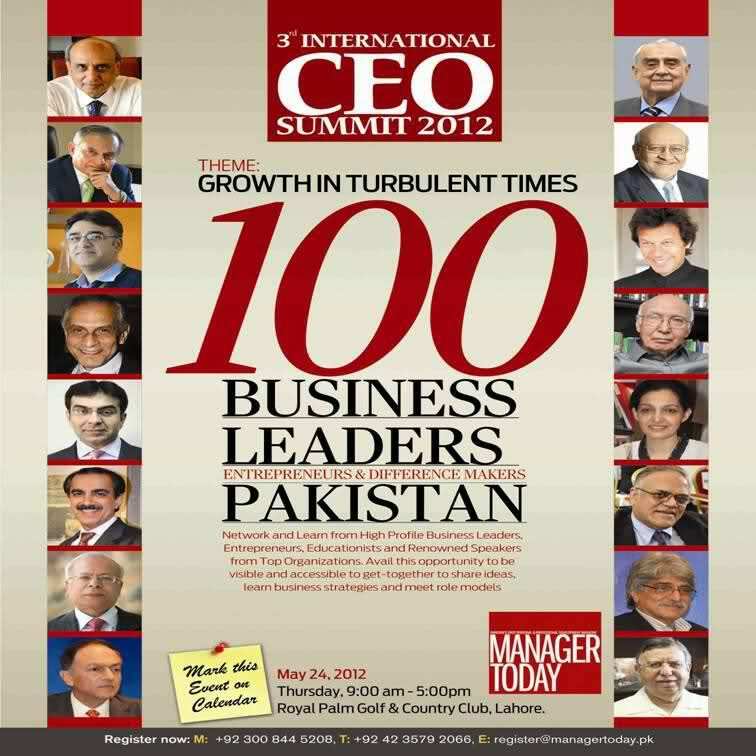 Manager Today has published its second book titled “ 100 Business leaders of Pakistan “ and focuses on three categories of leaders ; the first being Business leaders, entrepreneurs, Presidents, CEO’s and MD’s. The second category consists of women of substance who have contributed to education, economy, business and other fields. The third category consists of those who have tried to transform the nation. The exclusive interview and indigenous success stories serve as an inspiration to young minds who are the future business leaders by creating hope and faith in the country. The following interview of Mr. Ahmed Kapadia was published in this book as part of the first category mentioned above. 1) We are passing through very testing times with much of political instability and law & order situation going on, what steps should be taken to turn around/stabilize Pakistan economically as well as administratively? We need to focus on our basics such as making our institutions stronger. There is a need for a stronger infrastructure and a system where there is accountability with responsibility. All these things will be possible if effective leadership is in place. An effective leadership is owning any task that you take on. It gives focus, creates proper systems and procedures that others can follow. The same principle can be applied on a national level and even globally. Well, that’s my formula. 2) With the country sliding back into economic recession and creating extreme joblessness, how can we create job providers/entrepreneurs rather than job seekers? We have had a history of being colonized and somehow our mindset has remained that way. People have an employee mentality that needs to be overcome. We don’t seem to know how to behave like entrepreneurs. In order to overcome this we need to create a system where people understand the meaning of responsibility. In order to do so, we need to create some sort of a body that imparts training & development in this area .There is a need to create aSchoolofEntrepreneurshipdedicated to developing entrepreneurs at the national, provincial and district levels and also taught as a specific subject in schools. At the college level, those who are already established in this area need to teach and impart their experiences and provide guidelines to those who would like to follow. One can also focus on vocational training and have a fund that provides venture capital to those who would like to set up their own businesses. 3) We are not poor in resources but in effective managers, could effective managers and corporate governance help us deal with this dilemma? There will be effective managers if there is effective leadership. In my opinionPakistanhas a pool of extremely talented individuals. Despite having no infrastructure, we have created the best cricket players, squash and hockey champions. However systems, procedures guidelines and merit have to be the criterion. You cannot base your systems on nepotism as this will create disillusionment and your talented resources will be driven away. We need to have an effective leadership that can distribute resources. 4) With the commercialization of educational institutes, are you happy with the quality of business graduates being produced, especially with reference to the business education? I am totally against commercialization. The basic criterion for any business is that you must have a certain amount of passion for it. If for example you are in education, the sole criterion should not be making money but a desire to impart knowledge with excellence. Today, there are too many MBA’s – there needs to be a focus on specialists in specific areas such as media, advertising etc. 5) What is leadership to you? Are leaders born or made? Leaders are not necessarily born – leadership can be learnt and acquired like anything in life. But to learn it you first have to realize your own weaknesses as a person. Once you have done so, the right attitude will lead you to eliminate your own weaknesses and give you the impetus to focus on your strengths. A leader is a person who can give direction, lead by example, and who has the courage to admit his own follies and overcome them. He is usually a risk taker who exudes an energy that motivates and drives other people to perform better and is able to identify talent and bring that to fruition. 6) What are the challenges for the business leaders in Pakistan? Differentiate between a good manager and a good leader. The biggest challenge is that there is no level playing field. If you belong to a certain segment of society, you will be able to move ahead. There is a world of difference between a good manager and a good leader. A good manager is good at carrying out tasks assigned to him and in supervising those tasks. A leader will spell out the higher goals and the vision and provide the initial direction. 7) What are the core competencies of leadership that you want to see in our new managers & business leaders? The most important thing is to accept your strengths and weaknesses and develop a can- do attitude. It encompasses responsibility, perseverance, with a focus on good work ethics, initiative, positive thinking, pro activeness and a planned vision. Importance also needs to be placed on time management. A business leader has to be genuine and honest and must have a high sense of integrity. If you make a mistake admit it. People gauge you and if they feel you are honest and genuine they will want to follow you. 8) We are faced with a dilemma in professional ethics, how can we inculcate a sense of ethics in our managers? One should lead by example. It is important to display professional ethics to those who work for you and come within your circle of influence. You may not be able to have a direct influence on the people outside your environment, but when you inculcate those values in your own organization, it will make an impression on those who have worked with you and they will later inculcate those work ethics in their professional lives too. 9) What is your vision, mission, core values and shared behaviors that define your corporate culture? How do you make sure that people live, act and breathe your organization’s core values? The core values of Synergy form the foundation on which we perform work and conduct ourselves. These underlie our work, how we interact with each other and are the basis of our strategies to fulfill our mission. We believe in strong internal communication to impart these to those who work for us. We have a unique system which is a leadership empowerment committee in which the employees themselves take ownership and responsibility of different areas in the office and in doing so also learn the core values on which our organization is based. Values that we cherish include client- centrism, Integrity, equality and fairness, empowerment, responsibility and synergy itself which is collaboration and teamwork at every level. 10) Please share your key business strategies or business model that has led you to this current stature? Our business strategy is client focused with a solution oriented approach. Our business philosophy revolves around meeting the client’s requirements. We are in the communications business so we need to provide solutions for our clients through communication. We started off as an advertising agency but now have six business units specializing in different areas of communication, so that clients are provided with a complete package to satisfy their needs. 11) Do you have the high performance team with the right skill-set, mindset and value-set to lead the business growth? We have six business units and each of them is decentralized with their own team comprising of specialists with expertise specific to the particular unit. I don’t run all of them so that proves that they are independent, high performing and competent. 12) What are the challenges and opportunities in your industry/sector? The general perception in this sector is that a local agency must have a foreign affiliation to prove its competence. This is a fallacy as we can deliver quality work without these credentials. It is unfortunate that people only go on perception or the image of someone they see which then becomes a veil to being able to judge the competence and ability behind it. It is ironic that advertising is a science that creates perception and you can’t create perceptions without knowing reality. Another point that needs attention is that this industry does not have a platform to protect the interests of its members and provide solutions for their problems. The opportunities will rise as a result in the form of solutions to these challenges. 13) What are the HR challenges and strategies regarding employee retention, motivation, engagement and performance appraisals at your company? Pakistani’s are highly talented individuals; however they are not all that astute when it comes to working in teams. The biggest challenge is to make them gel together and understand interdependence, which is a key to creating Synergy. Employee retention and motivation require commitment towards high performers, which are vital for the growth of the organization. We have developed internal systems that are indigenous to Synergy through which we reward and appraise our top performers. 14) Is training, coaching and mentoring a high priority for you, how much time/resources do you devote to this? Yes it is of very high priority and a part of the culture of our organization. Each and every department is given training on a regular basis and a great deal of in house training is done frequently. 15) Can you share your contribution towards CSR (Corporate Social Responsibility)? I believe strongly in giving back to the society as I have seen that being done throughout my life by my grandfather first and then my father. It comes from the belief that you should do whatever you can for society rather than wait for it to happen. It is with the hope of making a purposeful life that the Latif Kapadia Memorial Welfare Trust was set up. It is a non-business organization purely established for the welfare of deprived and underprivileged families to provide them the best but inexpensive health and educational facilities within the community. The first Medi health clinic, an exclusive health project providing convenient and reliable OPD health services was set up in Shah Faisal colony and the second one has recently been set up in Khokrapar – Malir. 16) What steps should be taken to empower women professionally? Does your company have any harassment policy? We believe in providing equal opportunities. People are placed in positions on the basis of their competence and not their gender. Harassment is not tolerated at any level and the employee will definitely lose his job if he is making the workplace uncomfortable for females to work in. It is because of this that our organization is known for having an environment where women are respected. 17) Being the head of your organization, what are your strategies regarding succession planning and developing next generation of leaders? We focus on structured training and development and have made our business units independent so that they can be run by a competent team with the values and philosophy of our organization. 18) Please share your best management practices for others to follow as benchmark? We have set up a number of indigenous and unique systems in our organization that has helped in the overall performance of our employees. For e.g. we have developed a software called the “ticketing system” which is a tool to reward and motivate anyone who has done exceptional work that may be related to his/ her field or even outside of their sphere of work. This can be given by a junior to a senior and vice versa. Negative tickets can also be issued in the same manner. The ticket is associated with a monetary sum that is given as a bonus for a positive ticket and a deduction for a negative one. In addition we have also set up a committee called the Leadership Empowerment Committee ( LEC) that makes employees responsible for certain areas of the office that may not be related to their core jobs. For e.g. a person in client services will be looking after the ambiance in the office and be responsible for it. Employees develop a sense of ownership and also have a platform to show certain qualities that they possess which are not directly related to their work. In this committee all employees are at an equal level and responsibility is not dependant on hierarchy. In addition we emphasize on physical health and greatly stress on exercise and on well being. Keeping this in mind there is an in house gym and a cafeteria that serves healthy food. Grooming and appearance are also given a great deal of importance. We have always been receptive to expansion; this is why in a short span of 12 years we have evolved in to a group of companies. Synergy Group is the fastest growing communications group inPakistan, which is mainly based on this philosophy. We are also exploring opportunities in other countries and are hopeful that in the near future we will Inshallah make a breakthrough in the international arena. 19) Please share with us your professional background as to how it all started? 20) How would you define your leadership and management style? I am result oriented and it helps when one is aggressive towards work and business. However, despite my aggressive demeanour, I am caring towards my team and respect talent. There are many examples at Synergy where I have encouraged individuals to pursue their dreams and explore new avenues of business and opportunities. 21) What has been the toughest decision that you had to take so far? When I set up my own office in 1999 with almost nothing. It was a huge risk, as I decided to leave a cushy job for a completely unknown future. However, it has perhaps been the best decision of my life, as it allowed me develop an organization that is world class and is seen as a benchmark for how a professionally run communications business should be. 22) Define success in three key words or phrases. Success is attitude, attitude, attitude. 23) What is your idea of happiness? Internal satisfaction is the key to happiness. It is not easy to achieve; as there are many sacrifices that one has to be ready for. However, once you manage to benchmark yourself with high standards set by you, it is a great feeling. 24) From where do you get your inspiration, personally as well as professionally? From any story of a person fighting adversity and has been able to fight against the odds. This person can be a fictitious character from a movie, a novel or even real life. A person who can come through a struggle inspires me. 25) What is you favorite book on personal & professional development that you would recommend others to read? 26) What do you consider to be your greatest achievement or failure? Greatest achievement is being able to understand the value of how to create synergy. There is a long list of failures. 27) How do you manage workplace / business stress? Going to the gym, playing cricket and spending time with my family. 28) How do you keep your work-life balance? Honestly, there is no work – life balance. 29) Any message of hope to the young generation of managers, entrepreneurs and business leaders. Never ever give up. It is important to realize and accept your weaknesses and shortcomings and then create or find strategies to cover or eliminate those. Thereafter, concentrate on strengths so that your weaknesses are minimized. This is a blog, or web diary of Ahmed Hussain Kapadia, one of the leading figures of the advertising industry of Pakistan. Here you will find information about him and about his career; the achievements of Synergy Group in such a short period of time. Also, you may read the articles written by Ahmed Kapadia published in different magazines.